Get $20 back via manufacturer's mail-in rebate when you purchase this select Interlux Paint (for up to 2 gallons). See rebate forms for details. 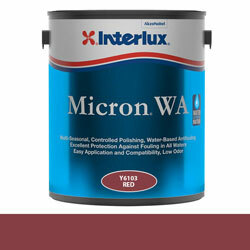 Interlux Micron WA combines powerful antifouling performance while reducing impact on the environment, leaving a smooth, clean hull. Ideal for cruise, power and sailboats and suitable for all waters.